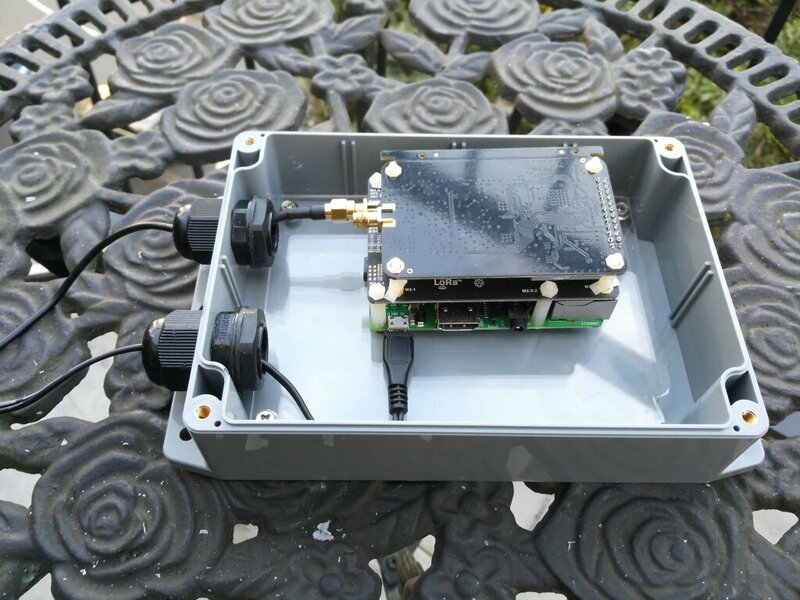 Here's a quick howto for Australasia, to construct a waterproof enclosure for a Raspberry Pi + Rak-831 LoRa gateway. Drill bits: 20mm, 18mm, 3mm, 2.5mm. -Cut the Perpex to size, 145mm x 113mm. -Drill eight holes in the Perspex. Four 2.5mm to mount the Raspberry Pi and four 3mm to affix to the Enclosure. -Drill two holes in the side wall of the Enclosure, one 18mm and the other 20mm. -Insert the Cable Glands into the holes in the Enclosure. 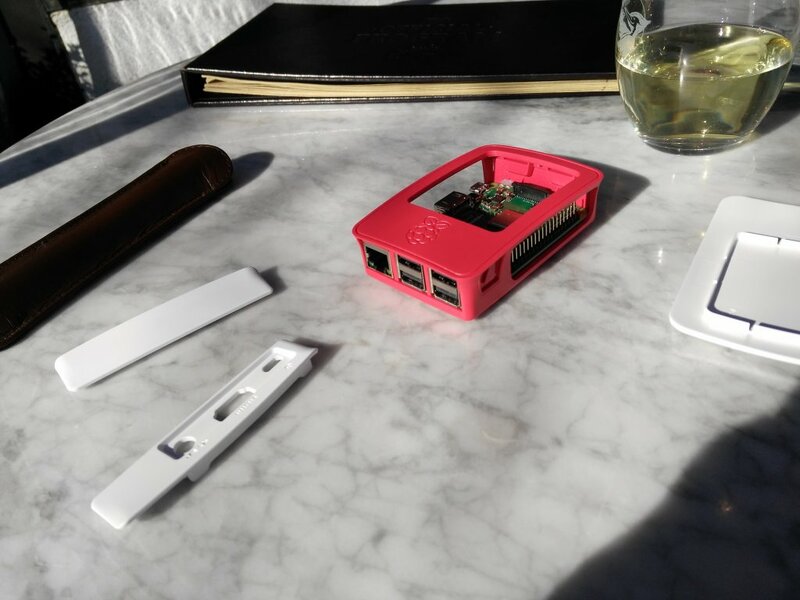 -Mount the Raspberry Pi on the Persex and affix the Persex to the Enclosure. -Run the cables for electricity supply, GPS antenna and LoRa antenna through the Cable Glands and connect to the Raspberry Pi. -Wrap insulation tape around the cables and the Cable Glands for waterproofing. -Attach the lid to the Enclosure. -Mount the Enclosure with the Cable Glands at the bottom, towards the ground. Viola! Another LoRa gateway is born. The Raspberry Pi model 3B astonished me today. Below I'll talk about my intentions for this device, namely off-grid automation at my family's beach house. Here above the fold I want to discuss r-Pi as a desktop alternative. Fedora 29, the latest version of the Linux distribution I've been using forever on my workstation and laptop, was released yesterday. Just for the hell of it I installed it on my r-Pi and I'm blown away by how well it performs. Not well enough to replace my workstation but not far off. In this photograph the $NZ89 device I'm holding in my hand is running Fedora full noise with GNOME 3.30 on XWayland. Okay it's only driving my 3840x2160 monitor at 2048x1080 but it's doing that without dedicated graphics hardware. Trust me when I say, that is impressive: this is the no compromises heavy duty Linux user interface configuration for a power user and r-Pi is keeping up. Here's the thing: I can outsource storage and processing. 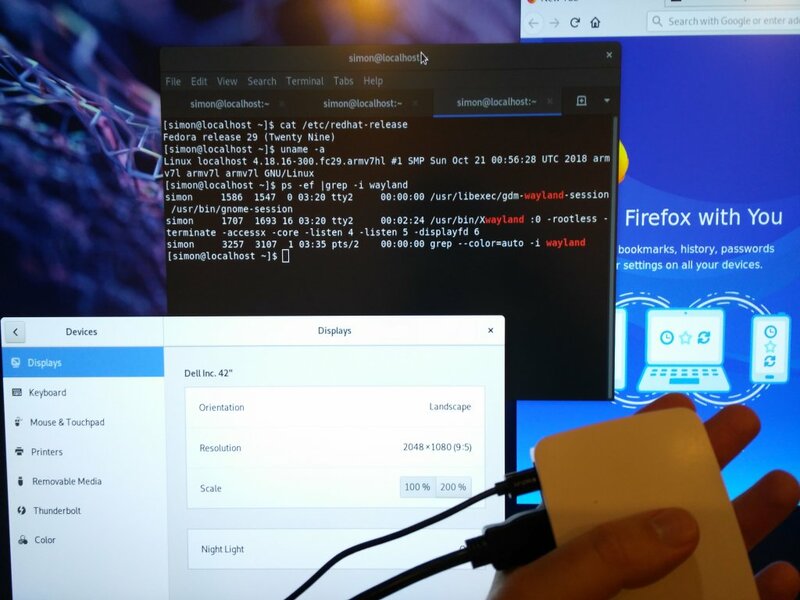 As soon as r-Pi can give me a snappy user interface that drives my monitor at full resolution and can run a Windows VM to host those annoyingly proprietary applications I need to do my job, it can replace my workstation. After playing with Fedora 29 on Raspberry Pi 3B today, I expect the next hardware release to be on the cusp. Now to the interesting part, Raspberry Pi for living off-grid or, Simon's Cunning Plan to Survive the Zombie Apocalypse. Here's the situation: our family beach house is the perfect place to survive the zombie apocalypse. It's located in a sheltered bay on a remote island in the Marlborough Sounds accessible only by boat or by helicopter. It has a constant fresh water supply, an abundance of protein from sea life and wild mammals, carbohydrates and nutrients from fruit trees, nut trees, and vegetable cultivation. From the perspective of Maslow's Hierarchy of Needs quite a few people could survive there comfortably as enlightened hunter/gatherers. The primary constraint is that it's mostly uninhabited: it's a holiday home sitting idle for most of the year. Which means it needs to operate fairly autonomously, at least until the fall of civilisation when I arrive to rule the post-apocalypse as a not-very benevolent autocrat. Which is where Raspberry Pi comes in, bringing me to our use case: operating the place autonomously whilst it's unoccupied, and facilitating operations when it is. Solar and Wind turbine collection, battery storage, 240v distribution. Biological waste management reliant upon electricity for aeration and pump. 24 dBi antenna and amp tuned by hand to attain one bar of cellular signal after many angry hours if I'm lucky. Motion detection sensors and cameras. Barometric pressure, outdoor temperature, indoor temperature, wind direction, precipitation, &c.
Not required. In New Zealand stuff just grows. Which brings me to current state. Right now the beach house is serviced by a Raspberry Pi Model 2B running Open Energy Monitor and OpenHab. Currently this monitors/manages the energy system and provides a user interface, and a framework for integrating the other systems. Which brings me to future state. Managing the Heating, Water, Sewerage and Environment systems requires mechanical devices with digital interfaces: IoT sensors to turn valves on and off, measure levels and flows, record environment values and so on. Which is where this daughterboard comes in. 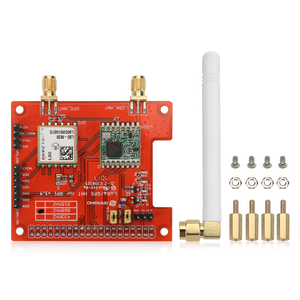 This is the Dragino LoRa GPS HAT for r-Pi providing GPS and establishing a LoRa network for the sensors required to manage the non-digital systems. It cost me $NZ60. When I get around to drawing it I'll add a diagram to this post to illustrate what all of this looks like conceptually. In the meantime and to summarise, the Raspberry Pi does everything I need for a paltry $NZ120 or so, and over the next few years I'll introduce sensors to integrate the other systems one by one at very minimal cost. And I'll very much enjoy doing it. When you're in the Marlborough Sounds catching your daily limit in fifteen minutes because the fish are jumping on the hook like they've joined a cult and the highlight of your week is a visit from the mailboat, whiling away the time on IoT automation is quite the pleasure. I splashed out $NZ120 on the new Raspberry Pi 3 Model B+ and a case today. Assembling it took all of thirty unsatisfying seconds. I'm blown away by the capabilities of this little device. If it weren't for compiles and the need to run Enterprise Architect and other specialised applications in a Windows virtual machine it could almost replace my workstation. The key feature of the new 3B+ model for me though is Power over Ethernet (PoE) and because it has it, this little baby is destined for great things. Our beach house is on an island in the Marlborough Sounds, one of the most remote locations on Earth. There is no infrastructure at all: no roads, telecommunications, waste disposal, or any other public utilities. Access is by boat, helicopter or seaplane. The location is the epitome of off-grid requiring a great deal of self-sufficiency to live there. Merely obtaining a 3G Internet signal necessitates a large, amplified antenna, precise tuning, beneficient atmospheric conditions and -typically- more patience than I can muster. Because of this the beach house is difficult to remotely manage and needs to operate fairly autonomously, which is where the Raspberry Pi comes in: all systems need to be integrated and controlled by the Raspberry Pi. Integrating all of these systems will take a while and utilise a plethora of different technologies. All of which are supported out-of-the-box with Raspberry Pi, and many of which come from the OpenHAB project which handily, also provides a simple user interface to it all. This $120 device is going to do it all eventually. But today -thanks to PoE- I'm just happy I no longer need to run a 20 metre cord to power the bloody thing.